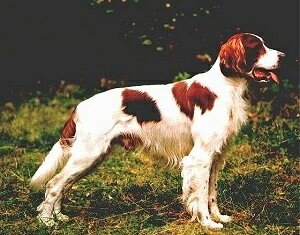 The Irish Red and White Setter is strong and powerful, without lumber—athletic rather than racy. The head is broad in proportion to body, with a good stop. Skull is domed without occipital protuberance as in Irish Red Setters; fairly square, clean muzzle. The eyes are hazel or dark brown, round, slight prominence and without haw. The ears are set level with the eyes and well back, lying close to head. The jaw is strong with a perfect regular scissor bite, i.e. upper teeth closely overlapping lower teeth and set square to the jaws. The neck is moderately long, very muscular, but not too thick, slightly arched and free from throatiness. The shoulders are well laid back. Elbows free, turning neither in nor out. Strong, oval bone well-muscled, sinewy, pasterns slightly sloping. The body is strong and muscular, deep chest and well sprung ribs. Back and quarters very muscular and powerful. Bone strong, well built up with muscle and sinew. The hindquarters are wide and powerful. Legs from hip to hock long and muscular; from hock to heel short and strong. Stifle well bent, hocks well let down turning neither in nor out. The feet are close-knit, well feathered between toes. The tail is strong at the root, tapering to fine point, with no appearance of ropiness, not reaching below hock. Well feathered, carried level with back or below in lively manner. The coat is finely textured with good feathering. Slight wave permissible but never curly. Coat colors are clearly parti-colored, i.e. base color white, solid red patches. Mottling or flecking but not roaning permitted around face and feet and up foreleg to elbow and up the hind leg to the hock. 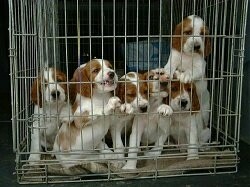 Irish Red and White Setters are energetic, intelligent, affectionate, loving, high-spirited and full of energy. They have no guarding instincts, get along with other pets and are good with children. This breed can be reckless and high-strung if it do not receive the proper amount of mental and physical exercise and may become destructive and hard to manage. Impulsive, with an independent spirit, they are sensitive to the tone of one's voice and will not listen if they sense that they are stronger minded than their owner, however they will also not respond well to harsh discipline. Owners need to be calm, yet possess an air of natural authority, being firm, confident and consistent, giving the dogs clear rules they must follow and sticking to them. Meek or passive owners or owners who do not provide enough exercise will find them to be difficult to train. Given firm handling and plenty of exercise, these dogs can be a joy to own. Start firm training early in life as it is easier to prevent behavior issues than it is to fix them once they start happening. Do not let this dog jump on humans, even as a small puppy. Teach them to heel on a lead and to let humans pass in and out gate and doorways before them. Relatively easily to housebreak. There are two types, field lines and show lines (bench). Field types are bred for hunting and field trial work and are generally somewhat smaller with shorter coats. The bench type is bred for conformation shows. Both types are energetic and need daily exercise, but field lines have a higher energy level and need even more exercise. The dominancy level in this breed varies even within the same litter. If you are not the type of person who can display a natural air of calm, but firm authority, then be sure to choose a pup that is more submissive. The temperament of both show and field lines vary widely, depending upon how the owners treat the dog and how much and what type of exercise they provide. 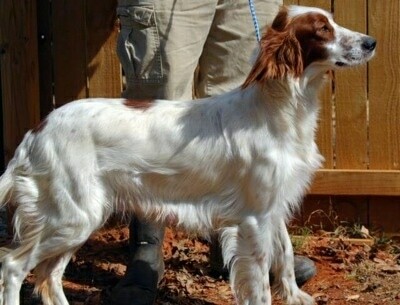 Irish Red and White Setters are extremely swift, with an excellent sense of smell and are hardy over any terrain and in any climate, working well even in wetlands. 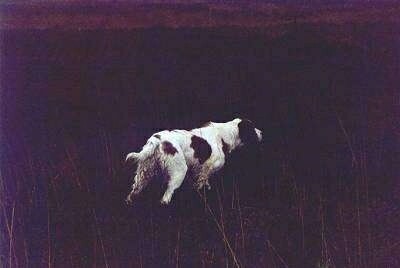 This breed is used for all types of hunting. Prone to von Willebrand’s disease and PPC (Posterior Polar Cataract), a relatively minor form of cataract that doesn't normally lead to blindness. Also, Canine Leucocyte Adhesion Deficiency (CLAD), which is an autoimmune disease. The Irish Red and White Setter is not recommended for apartment life unless the owners are active daily joggers or bikers and plan on taking the dog along with them. This breed does best with a large yard. Original Irish Setters were parti-colored, red and white. The solid red Irish Setters were rare. In about 1850 the red Irish Setter began to gain popularity. The parti-colored setter started its slow decline. 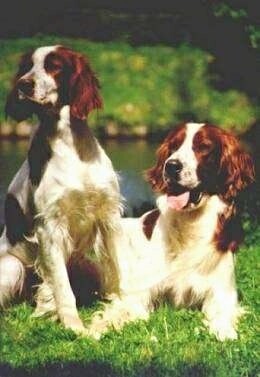 The Red and White Irish Setters became nearly extinct except for the few enthusiasts who kept the breed alive. In the 1920s an attempt was made at the revival of the breed and it is from here that present owners can trace their pedigrees. In 1944 the Irish Red and White Club was formed. 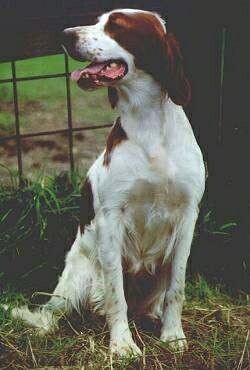 In 1984 the National Irish Red and White Setter Club of America, Inc. was formed. 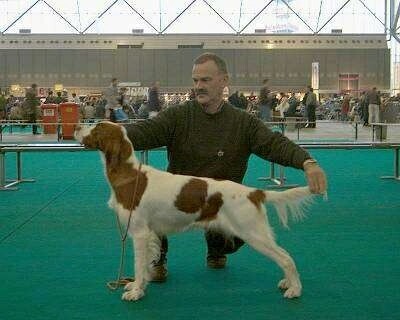 The Irish Red and White Setter was first recognized by the AKC in 2006. 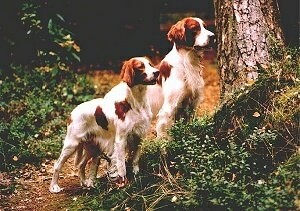 IRWSA = Irish Red & White Setter Association Inc.